I have a sunburned nose. It shines like a beacon through this grey and wet day, reminding me of the bask-inducing solar radiance of yesterday. It was a delightful double-whammy of low tide and warm sunshine. The air temperature was only around 19 degrees but the clarity of the sky and directness of the sunshine made it feel a lot warmer. My wife and I decided to go for a walk/paddle along the shore to cool off. The sea was relatively warm so I rolled up my trouser legs and waded out quite deep; trekking sandals protecting my feet from the sharp stones and shells which occurred in dense patches. We hadn't intended to forage but the lowness of the tide had revealed much of interest: great patches of greying kelp covered in large wilks; a ripe field of sugar kelp and sea lettuce; a razorfish graveyard crunching and splintering underfoot. As I approached a sandier patch a flounder shot out from near my foot and torpedoed in a straight line away from me, beaching itself on rocky 'reef'. It played dead and I briefly managed to pick it up but the fakery didn't last long - a few violent flaps and it was into the sea and away. Later on I saw a larger flounder - well worth eating if I could have caught it - with a darker body and strong white markings. They were probably both Platichthys Flesus but I'm really not sure, as the larger one looked so different - in colour and pattern if not in shape. My wife found a common whelk (bulot) attached to a cockle and sucking the life out of it; gastric slime hanging gruesomely from the deathlocked duo. I've been determined for some time that there must be clams larger than the tiny Abra Alba somewhere on Gastrobeach. Yesterday I came up trumps. I found half a dozen or so of a couple of different varieties ranging in size from around 40 to 70mm. There are so many different varieties of these 'hard shell clams' that I really don't know exactly which they were. I think the smaller, rounder one might have been a Blunt Tellin Tellina Crassa but it could just as likely have been a Dosinia of some kind. The oval-shaped ones would be even harder to identify: maybe some kind of Spisula. 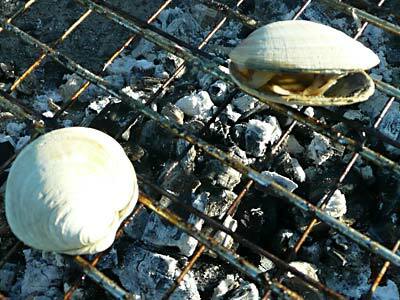 Regardless of which variety the clams happened to be, they were all very tasty cooked in the smoky heat of our barbecue. A dash of Cajun hot chilli sauce (mostly Scotch Bonnet and Habanero) was the perfect compliment to their salty, vaguely oysterish flavour. Foraging for food on the shore is easy and fun: just follow your nose. Or mine - you can't miss it right now. Thanks for your interesting post, I'm a big fan of sea-mollusks myself, cockels and mussels, limpets (an aquired taste and easely overcooked ;-)), and of course(pacific)oysters uncooked and straight from the rocks when we visit Brittany later on in the seazon. I bet the water in the Isle of Sky is nice and clean (a prerequisite for eating them IMO). Something that cannot be said of the Irish Sea here!